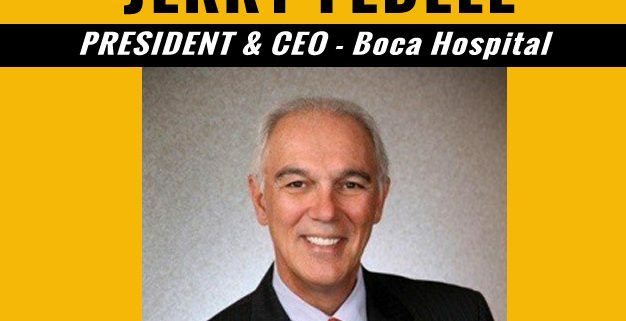 Jerry J. Fedele, President and CEO of Boca Raton Regional Hospital is speaking to the Gold Coast Tiger Bay Club on November 8th, in Boca Raton, at City Fish Market, from 11:30 am to 1:00 pm. Jerry Fedele has more than 30 years experience as a healthcare lawyer and chief executive officer in academic and regional health care systems. Over the last 15 years, Mr. Fedele has focused on restructuring and improving financially challenged hospitals. He is credited with saving a major academic hospital and three community hospital affiliates from the largest health care bankruptcy in US history through removing the hospitals from bankruptcy proceedings, restructuring debt, implementing a financial turnaround exceeding $140 million dollars, and completing a transformational refinancing exceeding $750 million. Mr. Fedele is currently the President and Chief Executive Officer of Boca Raton Regional Hospital where he led an initiative that resulted in operations improvement of $60 million over 18 months and then transformed an able community hospital to a market leading, regional referral medical center. Boca Raton Regional Hospital is an advanced, tertiary hospital that is ranked as a Top Regional Hospital by U. S. News & World Report, a Consumer Choice Award recipient by the National Research Corporation and has the most primary-affiliated physicians of any hospital in Palm Beach County recognized as “Top Doctors” by Castle Connolly. Under Mr. Fedele’s leadership, Boca Raton Regional Hospital has solidified community confidence in the Hospital resulting in record levels of philanthropic support and established a culture of clinical excellence and focus on patient satisfaction that have ranked the Hospital in the top 10% of more than 5,000 hospitals nationally. Mr. Fedele has led the evolution of the Hospital as an academic, tertiary center with the establishment of nationally leading clinical programs in cardiac care, vascular surgery, oncology, neurosciences, women’s care, advanced robotic surgery, and graduate medical education programs in medicine and surgery. Mr. Fedele is a former adjunct professor at Duquesne University School of Law and has lectured frequently on leadership and health law matters at Carnegie Mellon University, the University of Pittsburgh, and Florida Atlantic University. Throughout his career, Mr. Fedele has served on several boards, including The Hospital and Health System Association of Pennsylvania, The University of Pittsburgh Graduate School of Public Health, Community College of Allegheny County, and the Allegheny Conference. Mr. Fedele currently serves as a member of the boards of directors of the Boca Raton Chamber of Commerce, George Snow Scholarship Fund, VHA Southeast, and PGA Allianz Tour Event. Mr. Fedele has been recognized by the Boca Raton Rotary Club OPAL Award for outstanding achievement in healthcare, the South Florida Business Journal as an Ultimate CEO of Palm Beach County, The South Florida Business Journal as a Health Care Power Leader in south Florida, The Boca Raton Chamber of Commerce as Business Leader of the Year, and the South Florida Business and Wealth Magazine as the First Annual Palm Beach County CEO Apogee Awardee. Mr. Fedele received his Bachelors of Science in Mathematics with honors and Master of Business Administration degrees from the University of Pittsburgh and a Juris Doctor degree from Duquesne University School of Law where he was class valedictorian.